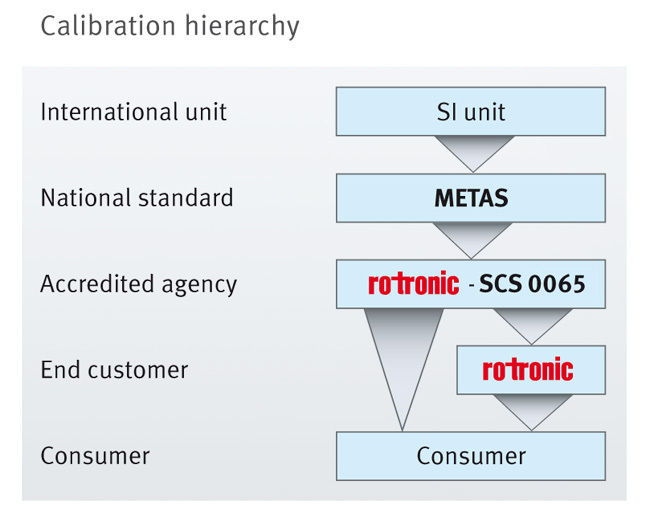 Even though ROTRONIC instruments have excellent long-term stability, we recommend that probes are calibrated regularly – once a year is normally sufficient. More frequent calibration may however be required if the probes are used in polluted/contaminated environments. Humidity and temperature measuring instruments are precision instruments that must be serviced regularly to maintain reliability. Measurement errors can result in substantial product damage during production and storage. If the last time you performed a calibration yourself is a distant memory attend one of our calibration seminars to refresh your knowledge and get some hands-on practice. What are the calibration options? Which calibration do I need: factory adjustment certificate (ISO) or SCS certificate? Your process requirements generally determine whether a factory adjustment certificate suffices or whether a SCS certificate is needed. SCS certificates are generally required in the pharmaceutical industry, the medical technology industry, research and development and the food industry. SCS certifications are performed with high precision reference hygrometers and for temperature calibration, an equally high precision temperature bath is used. The best possible SCS calibration accuracy can only be achieved if all process parameters are controlled and checked at the highest level – SCS certification is therefore only possible in our accredited laboratory (SCS-0065). We will gladly advise you on the optimal service for you. Contact your local ROTRONIC partner for support.